» LWB in France launches Codeweek in Europe with the Minister of Digital Affairs ! 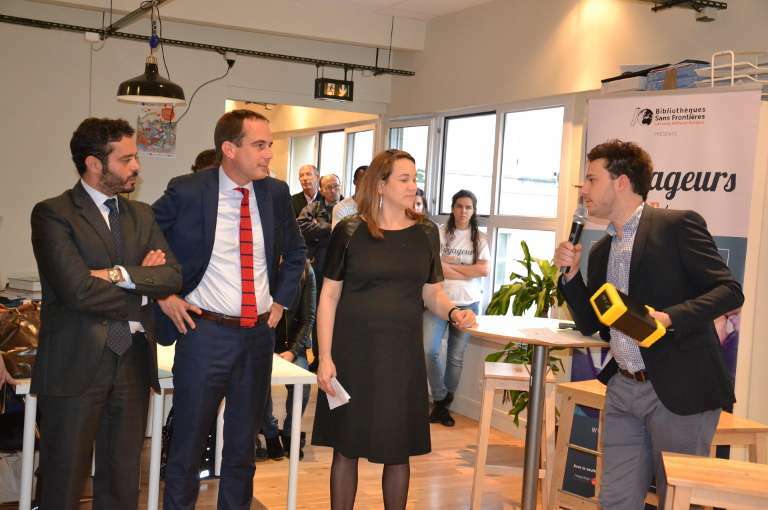 On Monday October 12th, Libraries Without Borders celebrated its new headquarters in Montreuil in the presenc of Axelle Lemaire, the French Junior Minister of Digital Affairs, Patrice Bessac and the mayor of Montreuil, Fabrice Chambon. The director of libraries in Montreuil, Hélène Grimbelle, the national education secretary of the Ligue de l’Enseignement, and of course Patrick Weil, the chairman of Libraries Without Borders and Jérémy Lachal, the Executive Director of Libraries Without Borders in France were also at hand. At the occasion, Jérémy Lachal took the opportunity to present the Koombook, the “little sister” of the Ideas Box. Axelle Lemaire even welded one of its links! This soirée was also the occasion to launch CodeWeek and to present Voyageurs du Code from all over France! Fun coding workshops led by the VDC were held for guests all throughout the evening. With close to 100 people in attendance, the soirée went late into the night, full of good conversation and cocktails.